The double cluster NGC 1850, found in one of our neighboring galaxies, the Large Magellanic Cloud, is an eye-catching object. It is a young, "globular-like" star cluster — a type of object unknown in our own Milky Way Galaxy. Moreover, NGC 1850 is surrounded by a filigree pattern of diffuse gas, which scientists believe was created by the explosion of massive stars. NGC 1850, imaged here with the NASA Hubble Space Telescope, is an unusual double cluster that lies in the bar of the Large Magellanic Cloud, a satellite galaxy of our own Milky Way. After the 30 Doradus complex, NGC 1850 is the brightest star cluster in the Large Magellanic Cloud. It is representative of a special class of objects — young, globular-like star clusters — that have no counterpart in our galaxy. 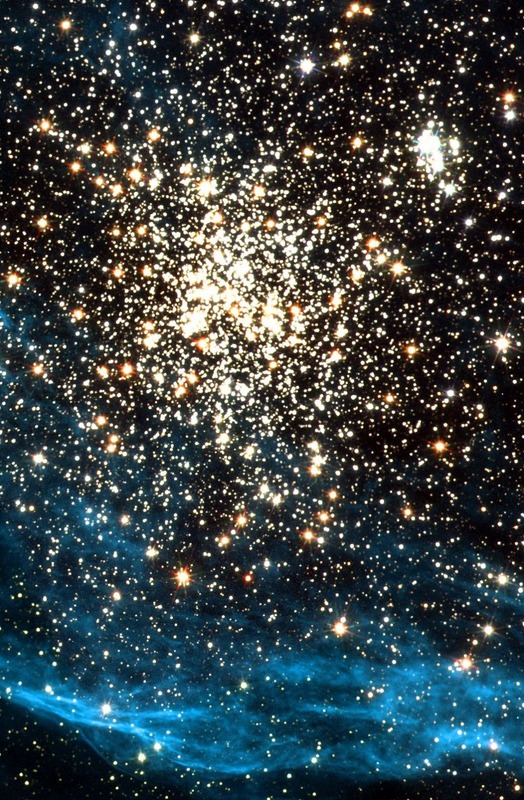 The two components of the cluster are both relatively young and consist of a main, globular-like cluster in the center and an even younger, smaller cluster, seen below and to the right, composed of extremely hot, blue stars and, fainter red T-Tauri stars. The main cluster is about 50 million years old; the smaller cluster is only 4 million years old. One of Hubble's main contributions to the study of NGC 1850 is in the investigation of star formation at both ends of the stellar mass scale — the low-mass T-Tauri stars and the high-mass OB stars. T-Tauri stars are young, solar-class stars that are still forming, so young that they may have not started converting hydrogen to helium, which is how our Sun produces its energy. Instead they radiate energy released by their own gravitational contraction. By investigating these stars astronomers learn about the births and lives of low-mass stars. T-Tauri stars tend to occur in crowded environments, but are themselves faint, making them difficult to distinguish with ground-based telescopes. However, Hubble's fine angular resolution can pick out these stars, even in galaxies other than our own. Hubble also has advantages when studying very massive stars. 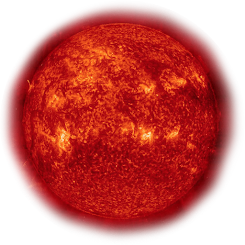 These stars emit large amounts of energetic ultraviolet radiation, which is absorbed by the Earth's atmosphere. From its position above the atmosphere, Hubble can detect ultraviolet light from these massive stars. The Hubble data can then be analyzed and used to characterize the stars' properties.